Pahoa Town is on the road to recovery! Pahoa Lava Zone Museum is the latest attraction! I only had a short time to explore the artifacts, including a few of the huge canvases that previously lived at the Jaggar Museum, in HVNP, until the massive earthquakes damaged the building, & is still in danger of falling into Halema'uma'u. I spoke museum docant, Kalia, & she was very knowledgeable, & eager to share, I will return, several times. Check out the lava coated honey comb! One still has wax on it. On a personal note, I am over the moon, that two of my (many) friends who were evacuated, (with only moments notice) have found missing kitties. One missing for 5 months, the other missing for 7 months, WELCOME HOME !! As always, please feel free to inquire. The road to Pohoiki (aka Isaac Hale Beach Park) is re-OPENED, & it is MAGNIFICENT!!! Pele chose to spare the majority of this popular spot, (she came really close, tho) however, the changes are significant. Previously a narrow, rocky coastline is now a HUGE black sand beach, the newest on the planet. The media did NOT do us any favors, as the bulk of the reports were inaccurate, visitors changed plans & chose not to come, so……We opened our doors to several evacuees from the Leilani area, as a way to contribute SOMETHING to those who have suffered loss or displacement during the volcanic eruption. Now that the eruption has calmed down, the work to rebuild, repair, & return is underway. HVNP, Hawaii Volcanoes National Park, is re-opening, (on a limited basis) to the public, & we will be able to see the massive changes to the landscape of Kilauea & Halema'uma'u. (The floor of the crater has dropped over 1600 feet!!) Mackenzie State Park has also re-opened, allowing us to see some of the new landscapes, new black sand beaches of the Lower East Rift Zone, LERZ. Discussion has begun to reopen some small portions of The Red Road to Pohoiki, so, for now it’s for the truly adventurous hikers. The local utilities are slowly restoring services to the residential areas that have been without, for months. While this process continues, local businesses are open, anxious & ready for visitors to help rebuild our economy that has suffered so greatly…. We are Puna Strong & we Stay Classy, Puna. ALOHA, August 2018 UPDATE... WOW, what a difference a few days makes! The volcanic activity that has been going on in Leilani Estates, just down the road, has significantly changed... Fissure 8 has calmed down, the lava river has crusted over, AND, Pohoiki STILL stands!... Up in Volcano, at the summit of Kilauea, the earthquakes & 'collapse events' have all but ceased! The changes in the landscapes is astounding. New black sand beaches are forming, each day, especially in the wake of hurricane Hector, he only sent surf & winds to redistribute the new sand that has been made by the lava entering the ocean.... We'll be watching/waiting to see what the future brings. In the mean time, "Stay Classy, Puna", come visit & see some true Aloha~ Sadly, the Waiʻōpae Tide Pools, (aka Kapoho Tide Pools) have been 'claimed', (among other natural wonders) however, there are plenty of wonderful places & to see & enjoy! 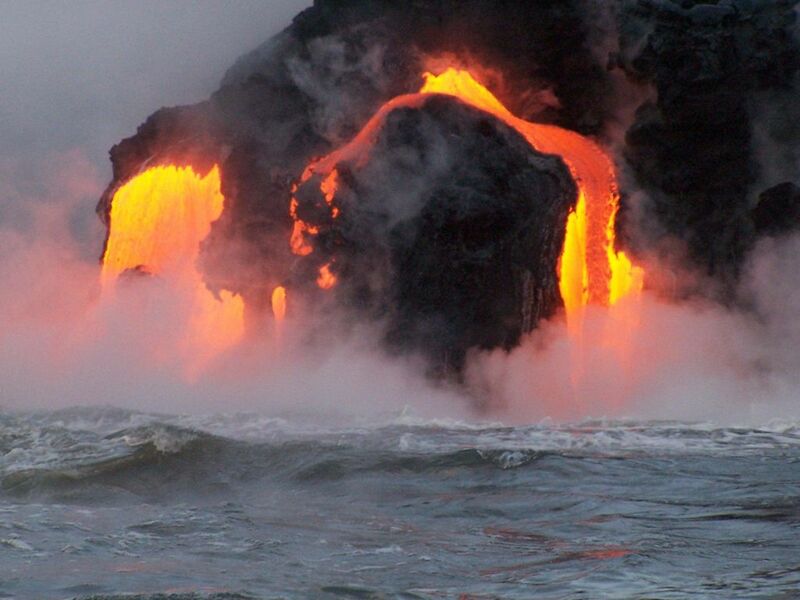 Even consider taking a Lava Boat tour, (happy to help with booking!!) or going to the Mauna Kea Visitors Center, at 9,200 feet, enjoy the BEST star gazing on the planet, & possible see the 'activity' from high above the clouds.. Inquiries welcome. Malama pono, Stay Classy Puna! Aloha, E komo mai! This studio apartment is located on a paved street, in the Puna District of the Big Island. Ideally located, less than 15 miles, from Hilo, Hilo International Airport, 3 miles from old Pahoa Town, 11 miles from Kalapana, the eastern access to the ocean entry of lava. Kilauea Volcano, (the most active volcano on earth) located within HVNP in Volcano, also close by, approximately 25 miles, door to door! Surrounded by mature rain forest, & fragrant foliage the street level apartment has a private entrance, & off street, gated parking. The efficient unit features view of the dense vegetation, a small kitchenette, including induction cook top (proper cookware provided), mini fridge inside (& access to full size fridge, outside, just around the corner,) microwave, small convection oven, & a variety of small appliances for your convenience. Secure Wi-Fi, or direct cat 5 cable, is available, supply your own devices! A queen size bed, generous closet with shelves & hanging space, small dining set, & large table for an office, or whatever, complete the living area. The modest bathroom has a shower only, no tub. Born on Long Island, NY, moved to Lake Tahoe, north shore, early 80's, guest/customer services all seasons, from loading you on a chair lift at a ski area or serving your dinner, pouring you a beer, making you a pizza.... More of the same, when i moved to Puna, in '06! I love helping people have FUN! Lots of local knowledge, very willing to help navigate around the area! Ecko, a 12 year old Lilac Point Siamese, a rescue kitty, is constantly patrolling the property! She insists on being acknowledged, & DOES understand the word "NO"! She may act like she is starving, altho, her figure shows she is well fed, please, do NOT feed her (she has ALLERGIES) & in consideration of others, please do not allow her inside the apartment, she can be sneaky! Her 'sister, Lani, an eight year old Russian Blue, also a rescue kitty, is around, you MAY catch a glimpse of her, & that is all, she is very shy! Ecko now has a couple assistant trainees! Cricket & Coqui were found, abandoned by their mom, when they were only 3 weeks old. They are currently in training as ambassadors of Aloha! Mature ohia, avocado, banana, lime, pineapple, puakenikeni, bromeliads, night blooming jasmine, burgansia, the list goes on!! 2 Bath towels, wash cloths, hand towels per person. Beach towels in closet. Mini fridge in apartment, full size just outside, around the corner. Plastic bags are provided in the freezer for ALL food scraps, including coffee grounds, (this helps to keep the property bug free! Lisa gave us many tips on places to go and places to eat. These were some of our best experiences on the island. She was very warm and welcoming and made us feel completely at home. Her cute, quaint little apartment is very private, surrounded by lush plants and trees. It was lovely to hear the frogs chirp at night. This is a very different part of the island with a vibe that is definitely 70s hippy. Great restaurants near by and very close to the volcanoes and the new black sand beach. We loved our stay here. Her sweet kitties were also a nice addition to our stay. Be sure to try the Tin Shack for breakfast and the Ohelo cafe in Volcano for lunch or dinner. Both are outstanding. Mahalo for your kind review! So glad you enjoyed your 'staycation' on the windward side, totally opposite environment from your home~ Hope to see you again! A hui hou!! Comfy, quiet studio in the forest with kitties! We stayed only one night, but received a very warm welcome from Lisa and the lovely kitties, not to mention a great number of super tips for tourist activities. Everything was clean, and the bed was comfortable. I enjoy coqui frogs singing, so that was good too. Surrounded by trees in a quiet neighborhood, it is a perfect way to experience a bit of how some of the locals live. I wouldn’t change a thing! Hoping the rest of your stay is glorious. We love Lisa! Her apartment was so lovely. Spacious & light and the bed was super comfortable. We enjoyed all that was this island including all the great suggestions she provides, awesome restaurant tips and must see sights. We drove 1000 miles around the island and was so nice to have such a great place to rest our heads. We will be back, I miss it already! Our pleasure to host epic adventurers like you, two! A THOUSAND miles in 6 days, including enjoying, (yet, not limited to) the sunrise over the Pacific, hiking in HVNP, star gazing on Mauna Kea, & kicking back, enjoying the "Kitty Olympics"! You may need a vacation after your vacation!! We'll keep the light on! This is a lovely space, especially for the price. Host is very helpful and friendly. This place was perfect for us. We would love to come back some time and would definitely choose to stay here again. The location was centrally located and great for visiting Pahoa, Kalapana, Pohoiki (Isaac Hale Park) and Volcano Village. It's not super fancy, but the host has taken care to make it quite comfortable and added special touches. Her knowledge of the area and willingness to share informations was also super helpful. I especially appreciate her making the time to take us to visit friends in Leilani Estates and see Fissure 8. She definitely went above and beyond anything that was required. Thank you so much, Lisa! We loved our stay with you and your sweet kitties. So glad you enjoyed your visit, reconnecting with old friends, & making new ones, including four legged ones!! Locals Review as Five Stars! My husband & myself were residents of Kapoho whose home was taken by Pele (Hawaiian goddess of fire who makes her home in the world's most active volcano) on June 5th, 2018. We were more fortunate than many having a safe place to stay until one week before closing on our new home. We are PUNA STRONG, returning, and scrambled to find a budget-friendly place. Ordinarily we would not choose where the owner lives on premises, concerns for privacy, but this more within our means set-up was all we could afford. The reviews here were all excellent so took a chance. The private entrance really is private. The studio more spacious than I had imagined. It is clean, comfortable & easy on the eyes in more ways than one with the cute decorations, reading lamp next to the bed & good lighting thru-out studio. An unexpected bonus was covered private seating area outdoors. Don't think this is advertised...maybe because not glamorous but it is certainly serviceable w/ an outdoor table, surrounds of intoxicating yellow ginger (almost always in season) scenting the area. There is a rusty on outside ol' well working full-size & CLEAN on inside fridge out there for those that need more space than the apartment-size fridge can hold or want use of a freezer. Keeping major appliances outdoors is common in Hawaii, rust is part of life in our beautiful rainy climate. Some malahini (newcomer) are shocked by a place they've rented being less than perfect. It is a BONUS to have this outdoor area! Owner, Lisa, living upstairs, we were hardly aware of because of the privacy between entrances. But she was wonderful when we did run into her, felt like been friend long time.